← I Blanked My Pants! I really dislike having my mouth worked on. It’s not that I have ever had a bad dentist or bad experience, I just don’t like it. This is why I am so amazed with what I am about to write. I was having a problem with one of my back teeth. My dentist referred me to a periodontist who told me I had in fact fractured the tooth. I had two options; I could do nothing and risk having the infection underneath the tooth compromise the teeth in front of it, or I could pull the broken tooth out. Really no option, it needed to be removed. Little did I know that I would be getting a lesson in customer service, you could say a mind blowing lesson. 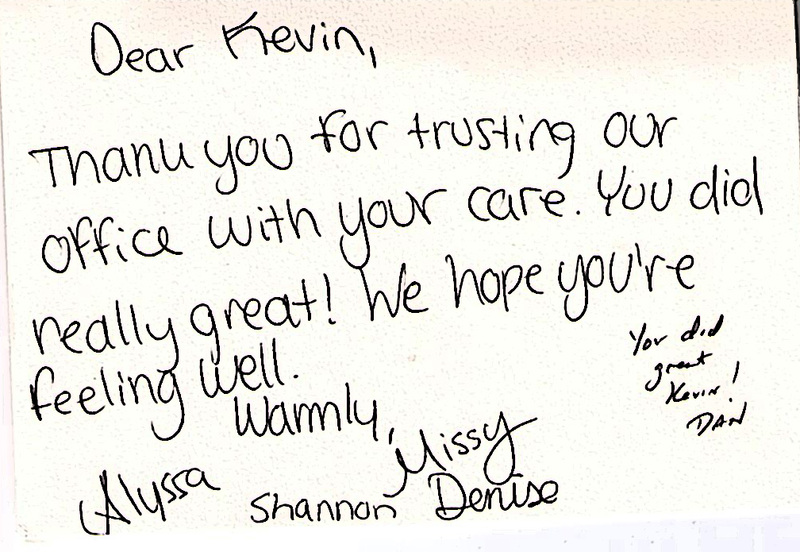 Thank You Note Signed By Staff of Crestal Health. I was sitting in the Longmeadow office of Crestal Health Periodontics where Doctor Daniel Stiefel told me it would be ‘an honor’ to do my extraction. The use of the word ‘honor’ in conjunction with me has never happened so already I was surprised and impressed. Before we had even got to this point, Doctor Stiefel sat and had a conversation with me that was different than any previous medical procedure. Just a general conversation that was striking for its relaxing effect. A week later I arrived for the pulling of the tooth. I was primed by a week of horror stories of tooth extractions gone bad. There was the jaw pressure, the crunching, the pain, the swelling. You get the idea, people were just helping me out! Tell people what you are going to do. Tell them what you’ve done. This coupled with ‘under promise and over deliver’ made for a positive experience. My medical procedure was not that at all, it was a human procedure. A procedure so skillfully executed it is worth sharing. Posted on April 24, 2013, in Business, Life, Management and tagged business, crestal health, customer service, dentist, extraction, health, longmeadow, management, mediical, periodontist, teeth, tooth. Bookmark the permalink. Leave a comment.